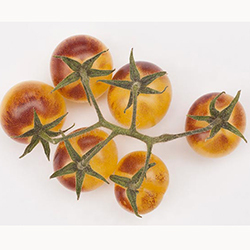 To make our Top Pick list, varieties must of course taste great, but also be consistent in flavor and production from year to year and have relatively few problems. These have proven themselves, and are staples in our own gardens. Very sweet fruit with thin skin too! This is our sweetest variety, and the earliest to produce. Incredibly productive plants provide loads of fruit non-stop until frost. One of the best I've grown, I LOVE this tomato. Purple-brown-red beefsteaks are meaty, sweet and full flavored. Resists cracking, and plants produce an abundance of fruit over a long season. A recent introduction by a highly regarded midwest grower/breeder. Easy to grow, with consistently good production of yellow, smooth crack-free 3-4" fruit with very good sweet, citrusy flavors. A Russian heirloom. Early for a beefsteak, beautiful and delicious. 4" fruits are juicy with tropical sweet flavors. Prolific production. Our most popular variety. Fantastic, subtle, sweet flavors and very juicy. A definite favorite of ours. Great with Burrata or other mild fresh cheeses. Produces incredibly well for a beefsteak. On Slow Food's Ark of Taste list as an endangered variety. Classic rich, complex, sweet flavors Brandywines are famous for, and this one produces consistently. 5" fruits tend to come in flushes, 6-8 or more in a flush, then you must wait patiently for the next flush. Well worth it! On Slow Food's Ark of Taste list as a rare, endangered variety. Our favorite bi-color tomato! Sweet, richly flavored and well balanced, this beauty has produced extremely well for us and is a hit with most who taste it. Medium to large sized fruit are orange yellow with beautiful red streaks. Sweet Frying Pepper, "Jimmy Nardello's"
Fantastic flavor and production. Fruits are bright red with thin flesh, crisp, sweet and complex. Great for eating right off the vine or as a frying pepper. On Slow Food's Ark of Taste list as an endangered variety. As with most bell varieties, these take awhile to ripen, but are well worth the wait. Plants are quite productive and produce beautiful, orange, sweet, crunchy bell peppers, 4-5" long. Unmatched flavor! My go-to chili for roasting and stuffing. Productive too. This is one of the famous 'Hatch' chilis grown for over a century in the Hatch Valley of New Mexico. Medium heat. Jumbo sized, thick-fleshed jalapeños, these easy-to-grow peppers are perfect for poppers, or for fresh salsas and guacamole. Plants grow to 30" tall and are very productive. Incredibly productive, vigorous vines produce superb cucumbers, great for fresh eating or pickling. Crispy and bright, with no bitter taste. 3-4" blocky, cream to green fruits. Amazing long fruits are great as summer squash but can be left to mature as winter squash. Fruit is buttery, firm, and richly flavored, great for grilling. Seed cavity is only in the bulb end. Vigorous, sprawling vines produce huge, bright orange fruits with mild, light, tender flesh. Fantastic flavor, moist, not overly sweet and dense as some winter squashes can get. Vines are quite productive, producing 6-8" ribbed fruits consistently over a long season. Fruit is incredibly fragrant with sweet, juicy, bright orange flesh. Irresistible.